We have been a sponsor of the Fayetteville FireAntz for the past 2 years, and truly enjoy our partnership in providing their two-way radio communications. 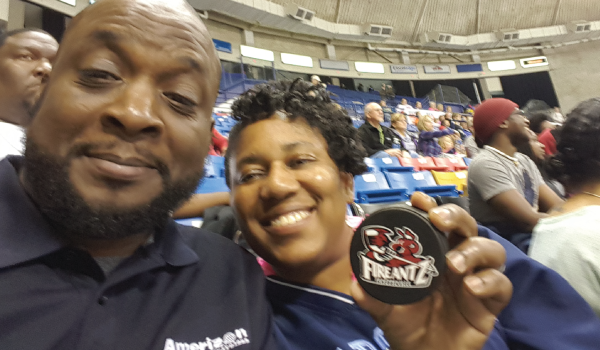 They treated us to great seats in the Crown Coliseum to watch the FireAntz take on the Huntsville Havoc. Our very own, Thomas Johnson even had the honor of dropping the ceremonial puck to start the game. The atmosphere was electric in the arena as the FireAntz were only two games away from the end of their regulation season and were pushing hard for a high-seeded playoff spot; however, the Havoc swooped in to pull of the 2-1 victory over the FireAntz, in overtime. This didn’t stop the determined Fayetteville team from defeating the Havoc 4-3 the next night, to close their season in 2nd place; securing a high position to start their playoff run! We want to thank the FireAntz for hosting a great corporate night for us and our families, and we look forward to continuing our sponsorship for many years to come. PHOTO CREDITS TO THE CROWN COLISEUM AND FAYETTEVILLE FIREANTZ.